U.S. Customs and Border Protection on May 12 at the Anzalduas International Bridge seized alleged cocaine valued at $186,660 during an enforcement action, according to a Tuesday news release. 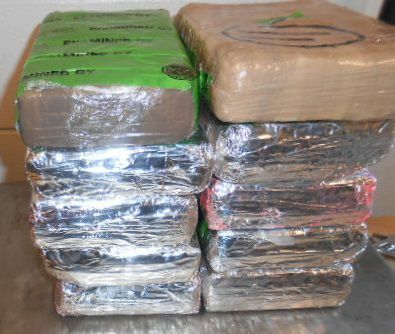 HIDALGO — U.S. Customs and Border Protection on May 12 at the Anzalduas International Bridge seized alleged cocaine valued at $186,660 during an enforcement action, according to a Tuesday news release. The seizure occurred after CBP officers referred a green 2006 Volkswagen Jetta driven by a 24-year-old female from Pharr for a secondary inspection, the news release states. After a physical inspection of the vehicle with the use of a non-intrusive imaging inspection and the assistance of a canine team, officers discovered 10 packages allegedly containing approximately 24.21 pounds of cocaine, according to the news release. CBP OFO seized the narcotics along with the vehicle, arrested the driver and turned her over to the custody of Homeland Security Investigations agents for further investigation, the release said.